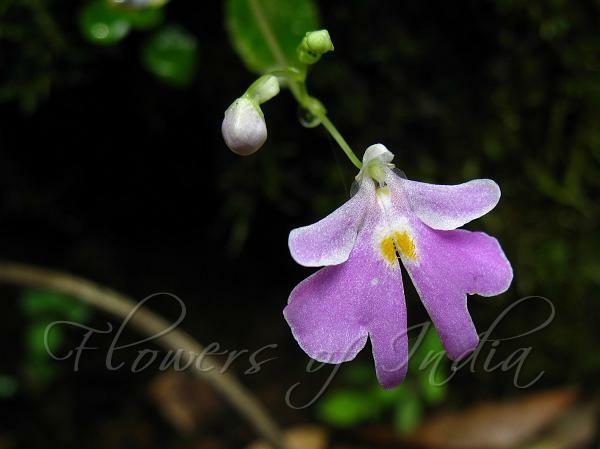 Agumbe Balsam is a slender herb growing on mossy tree trunks. Leaf-stalks are up to 3.5 cm long, leaf-blade ovate-elliptic, saw-toothed on margins, up to 4 cm long and 2 cm wide. Flowering stem is up to 13 cm long. Flower-stalks are up to 2 cm long. Lateral sepals are ovate; median sepa saucer-shaped; spur slightly sickle-shaped, broader and flattened distally, blunt at tip, up to 7 mm long. Flowers are pink, wings 3-lobed, 1.5 cm long, short clawedl dorsal ear slender, elongated, up to 5 mm long, produced into spur. 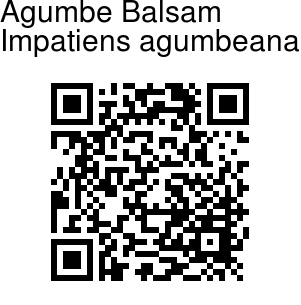 Agumbe Balsam is endemic to Karnataka. Flowering: August-September. Identification credit: Bhaskar V. Photographed in Agumbe, Karnataka.